Before the wasiju ("white man" or "ugly hairy one") ventured onto Ĩyãħé Nakoda territory, the Ĩyãħé Nakoda had always been self-governing and self-sufficient. They fiercely protected their traditional homeland from enemy intruders. Alternatively, they conducted trade with those that became allies including the neighbouring Cree, Kootenai, and Shuswap, as well as with tribes beyond. Certain individuals were selected to be leaders of the groups of clans. Some were chosen from childhood when they displayed particular characteristics that were then groomed. This included youth having dreams and visions that ultimately became physical manifestations. At the right time of their maturity, they would be proclaimed as Hũga ("Chief"). By oral tribal law, the Head Chief was required to erect his ti ("dwelling", now commonly referred to as a "tipi") in the middle of a large circle of tipis. He stood out as a leader for his prowess, wisdom, and wealth. However, it was not the Head Chief that taught the younger people. Other leaders within the group possessed identifiable capabilities and had specific titles and responsibilities. For example, War Chiefs groomed the young men as warriors and led them in battles against their traditional enemies, the Blackfoot and the Crow. They taught the young men how to steal horses, how to fight, and how to escape from the enemy. They also taught the many attributes of a warrior's character and responsibilities. At times, weaker Chiefs and leaders were ousted and replaced. Wise, older men within the group would be summoned by the Head Chief to meet in his tipi and determine restorative justice for various offences, often committed by renegade warriors with an overzealous sense of bravery. Trusted leaders, including the Keepers of the Drum, Keeper of the Fork, Keeper of the Lance, Keeper of the Knife, Keeper of the Whip, and Feather Belt dancers, meted out the prescribed punishment. There were numerous oral laws of the Ĩyãħé Nakoda regarding birthing, child rearing, marriage, disputes, food distribution, and care of the old and infirmed. One specific law that both the father and mother taught their sons was not to be killed in battle from a wound in the back. It was far better for the parents to know that their son was killed by the enemy from a wound in the front of the body. Although the Ĩyãħé Nakoda was a patriarchal society, roles of the men and the women were balanced. Men were the providers, while women took care of domestic responsibilities. Women gave life to, raised, and taught the children. They also had a strong family voice within their own tipis. After Confederation of Canada in 1867 a series of Treaties, known by numbers, were made with Indigenous groups on the prairies west to the Rocky Mountains. The Commissioners of Queen Victoria of England, other Government representatives, and also missionaries met and negotiated with the Indigenous peoples. On September 22, 1877, Treaty 7 was signed between the Queen and five Indigenous groups known in their own languages as Siksika, Tsuu T'ina, Kainai, Piikani, and Ĩyãħé Nakoda . The Ĩyãħé Nakoda were referred to as "Stony" on the Treaty document. The Treaty stated the five Indigenous groups would each "cede, release, surrender, and yield up to the Government of Canada for Her Majesty the Queen and her successors for ever, all their rights, titles, and privileges whatsoever" to their traditional territories, which were described in the document. The Indigenous groups were to be assigned Reserve lands within their respective traditional territories. The Reserves were comprised of one square mile for each family of five persons, adjusted proportionately for larger or smaller families. The Reserve in Ĩyãħé Nakoda territory assigned to the "Stony Band of Indians" was in the vicinity of Morleyville where, in 1873, Methodist minister John McDougall had established a mission. On their respective Reserves, the Indigenous groups were to receive annual payments, funding for ammunition, clothing for the Chiefs, education for the children, agriculture equipment, livestock, and seed. The goal was to encourage the Indigenous groups to become farmers on their Reserves. Subject to Government regulations, they could continue to hunt off the Reserves. By peacefully containing the Indigenous peoples on Reserves with the Treaty agreement, the Government could impose its version of "civilization" by having them learn an agricultural trade, and could educate them according to wasiju teachings. However, neither the land on the Reserve allocation for the Ĩyãħé Nakoda nor the climate was conducive for farming or ranching, as the government had intended. Lands obtained by the Government through the Treaties were, in turn, made available for immigrant settlement, as well as for agriculture and resource development. Revenues offset the expense of Indigenous assimilation. To this day, the Ĩyãħé Nakoda maintain they were misled during negotiations leading up to and including the signing of Treaty 7. Translation between the parties was inaccurate. The written words of the Government's Treaty document were misrepresented to the oral understanding of the Ĩyãħé Nakoda. They believed it was an agreement to put down their weapons and make peace with the wasiju, with no interruption to their use of traditional lands. During the 1800s, various pieces of legislation and amendments were enacted regarding Indigenous peoples in Canada. Such policies were developed by the British and Canadian officials without input from the Indigenous peoples. In 1876, the federal government of Canada consolidated these laws into one document and passed the Indian Act. The Minister of the Interior became responsible for Indigenous affairs, while Indian Agents lived on the Reserves to ensure compliance. The lives of the Ĩyãħé Nakoda became very restricted and paternalistically controlled. The Indian Act contained a number of clauses, including the definition of the word "Indian", which was: "An Indian is any male person of Indian blood reputed to belong to a particular band, any child of such person, and any woman who is or was lawfully married to such person." The underlying intent of the Indian Act was to convert the Aboriginals from their traditional way of life and transition them into Canadian social structure. Over the years, revisions and amendments to the Indian Act were made. Some clauses were repealed or ceased to be valid with the changing times. A new Indian Act was introduced in 1951 with few major changes, other than the removal of the government's policy of aggressive assimilation. Despite giving more power to the Chief and Council on a Reserve, the federal Minister of Indian Affairs retained veto power over decisions. 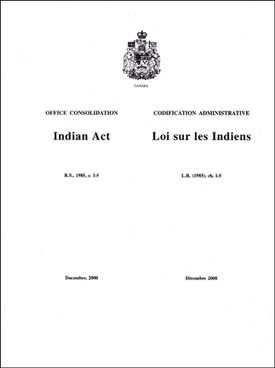 In 1985, passage of Bill C-31 by the Canadian government resulted in an amendment of the Indian Act to eliminate discriminatory provisions according to the Canadian Charter of Rights and Freedoms. A further revision included the right by the Indigenous peoples to determine their own rules of membership to their respective Band, now more commonly referred to as a First Nation. Other amendments have been made since 1985. To this day, the Indian Act remains in effect, and the Ĩyãħé Nakoda remain under its directive. Indigenous peoples are under jurisdiction of the federal government, which has a fiduciary obligation to First Nations. This includes the Ĩyãħé Nakoda. The federal department responsible for upholding the Government of Canada's legal commitments to Indigenous peoples has undergone several name changes through the years. What was previously known as the Department of Indian Affairs (DIA), Indian and Northern Affairs Canada (INAC), Indian Affairs and Northern Development (IAND), and Aboriginal Affairs and Northern Development Canada (AANDC), is now officially called Indigenous and Northern Affairs Canada (INAC). INAC is a bureaucratic body that predominantly functions according to legal responsibilities under the Indian Act, statutes, agreements, and decisions through the courts. First Nations receive annual approved funding monitored and controlled by INAC for essential programs including education, housing, health care, social development, infrastructure, and administration. INAC is in charge of negotiating and administering Indigenous land claims and settlements, as well as self-governance agreements. It also manages land. As defined in the Indian Act of 1876 and its subsequent revisions, specific criteria determine the legal identity of Indigenous peoples. INAC maintains an official registry for Indigenous peoples classified as a "Registered Indian", more commonly referred to as a "Status Indian". Qualified individuals are issued a "Certificate of Indian Status (CIS)" as verification. They are required to provide this document to access certain benefits provided by federal and provincial programs and services. INAC publicly proclaims support of Indigenous peoples for self-governing initiatives, community sustainability, socio-economic accomplishments, and for an increased involvement in Canada's future. However among Indigenous peoples, including the Ĩyãħé Nakoda, there remains a strong distrust and often an intense dislike of INAC and its personnel. Decades of paternalistic oppression by this government entity is not forgotten. Positive relationships, based on equality, good faith, honesty, and integrity, take time to establish and maintain. After Treaty 7 was signed in 1877, the Ĩyãħé Nakoda were recognized by the federal government as one entity, the Stony Band of Indians (later referred to as the Stoney Band or Stoney Tribe). However, they have always maintained three separate group affiliations while living together on the undivided Reserve land base. In 1877, Ožĩja θiha (Bear Paw) was Chief of the southern group. He was named Jacob by the missionaries. This group became known as "Bearspaw Band". At the same time, John Chi-ne-ka (Chi-ne-ka is a Cree word) was accorded Chieftainship of the central Ĩyãħé Nakoda group by virtue of his leadership qualities. He was named John by the missionaries. This group became known as "Chiniquay Band", and since the 1980s it has been known as "Chiniki Band". Jacob Ki-chi-pwot (Ki-chi-pwot is a Cree word) participated in the Treaty 7 negotiations as an emissary on behalf of the northern Ĩyãħé Nakoda group. He was named Jabob by the missionaries. When he placed his mark on the document, the government recognized him as a Chief, and the northern group was then called "Jacob's Band". Historically, the role of the Head Chief of a Ĩyãħé Nakoda group was inherited. Occasionally, when a Chief did not fulfill this role according to oral laws, he was ousted and replaced by a more suitable leader. 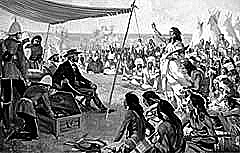 After confinement to the Reserve, the Hũga ("Chief") would meet with the θaba Ĩ-hnuwi ("Minor Chief" or "Councillor") to discuss matters concerning their group. The three main groups, each with their Chief and Councillors, assembled as a Tribal Council to discuss collective issues. Unlike the significant roles they held prior to the signing of Treaty 7, their power was severely restricted by the Indian Act and by the Indian Agent on the Reserve. In 1952 the Ĩyãħé Nakoda held its first-ever custom election for the Chiefs and Councillors of the Bearspaw, Chiniquay, and Wesley Bands. Candidates and electors were required to be registered Band members, and selection could only be made from within their own Band membership. David Bearspaw was the first elected Chief of the Bearspaw Band, with John Dixon and Jonas Rider elected as Councillors. For the Chiniquay Band, Jacob Twoyoungmen was elected Chief, and John Powderface and Tom Kaquitts were elected as Councillors. Tom Snow was elected Chief of the Wesley Band, and Judas Hunter and Eddie Hunter were elected as Councillors. Over time, the number of Councillor positions eventually increased from two to four for each Band. By 1957, the term of office for the Chief and Councillors of each Band was set at two years. Forty-five years later at the 2002 elections, the term of office for the Chiniki Band was extended to three years, and for the Wesley Band it was extended to four years. In 2013, the term of office for the Bearspaw Band was extended to three years. In the 1960s, the federal government began to encourage movement toward self-government by Bands across Canada. The Ĩyãħé Nakoda were no longer under such strict governmental controls. However, after nearly a century of paternalistic oppression they needed to re-learn self-sufficiency, but in a new era of modernization. Following a referendum vote agreeing to merge to a "one Chief, one Band" governance, in 1974 Frank Kaquitts of the Chiniquay Band was elected as a single Chief for the three Bands that united to form the Stoney Band. There was much dissent among the voters regarding this change and, very shortly thereafter, the Ĩyãħé Nakoda reverted back to the "three Chiefs, three Bands" governance. Only seven women have been elected to represent the Ĩyãħé Nakoda people. The first was Valentine (Tina) Fox, who was elected as a Councillor for the Wesley Band in 1976. She served seven two-year terms. Kathleen Poucette was elected as Councillor for the Wesley Band in 1978. During the 1980s and 1990s, Evelyne Labelle, Georgie Chiniquay, and Margery Twoyoungmen were elected as Councillors for the Chiniki Band. After serving two terms as a Councillor for the Bearspaw Band, Una Wesley was elected as Chief in 1984. This was the first-ever female Chief among the Ĩyãħé Nakoda. 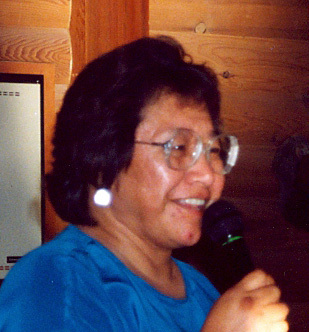 She was again elected as Bearspaw Chief in 1988. Philomena Stevens was elected Chief of the Bearspaw Band in 1996. The current total population of the Ĩyãħé Nakoda residing at Mĩnĩ θnĩ Wa-pta (Morley Reserve), Ga-hna (Eden Valley Reserve), and Kiska Wa-ptadn (Big Horn Reserve) is approximately 4,600. Each Band is comprised of about one-third of this populace. Approximately 82 percent reside at Mĩnĩ θnĩ Wa-pta, 14 percent reside at Ga-hna, and four percent reside at Kiska Wa-ptadn. According to the number of registered Band members in each community, it was essential for residents to have political representation by their respective Band. This resulted in the Bearspaw Band Council being comprised of one Chief, plus two Councillors from Mĩnĩ θnĩ Wa-pta, and two Councillors from Ga-hna. The Chiniquay Band Council became comprised of one Chief, and four Councillors from Mĩnĩ θnĩ Wa-pta. The Wesley Band Council became comprised of one Chief, plus three Councillors from Mĩnĩ θnĩ Wa-pta, and one Councillor from Kiska Wa-ptadn. Although the federal government originally labelled Indigenous groups with the term "Band", this has been evolving into the name of "First Nation". The Ĩyãħé Nakoda groups are currently referred to as the Bearspaw Nakoda Nation, Chiniki Nakoda Nation, and Wesley Nakoda Nation. The collective name is the Stoney Nakoda Nation but is also still known as the Stoney Tribe. Darcy Dixon is presently Chief of the Bearspaw Nakoda Nation. Rex Daniels, Gordon Wildman, Anthony Bearspaw, and Lenny Wesley are the Bearspaw Councillors. Aaron Young is presently Chief of the Chiniki Nakoda Nation. Charles Mark, Charles Powderface, Jordie Mark, and Colin Simeon are the Chiniki Councillors. Ernest Wesley is presently Chief of the Wesley Nakoda Nation. Hank Snow, Watson Kaquitts, Marlin Poucette, and Marvin Abraham are the Wesley Councillors. Approximately 30 days after being elected to office, the Chief and Councillors of the Ĩyãħé Nakoda attend a public Inauguration or Swearing-in Ceremony. At this Ceremony, they each accept a sacred Eagle Feather from an Elder while making an oral Commitment to take the role of traditional Chief or Councillor with respect, honesty, and trust during their term of service. Failure to uphold what the Eagle Feather symbolizes could result in it being returned to the people, followed by resignation of the position. 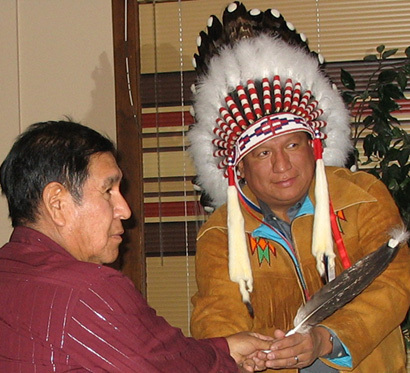 The three Chiefs and 12 Councillors of the Ĩyãħé Nakoda comprise the Stoney Tribal Council. While still under statutes of the Indian Act, this local government entity is responsible for the complex overall self-governance of the Mĩnĩ θnĩ Wa-pta, Kiska Wa-ptadn, and Ga-hna communities. Tribal Council is the primary decision-maker and policy-maker on behalf of the registered membership. For Tribal or for individual First Nation matters, the Chiefs and Councillors attend external meetings and confer with program directors of Indigenous and Northern Affairs Canada (INAC), federal and provincial government personnel, lawyers, bankers, accountants, corporate executives and business professionals, the national Assembly of First Nations, Treaty 7 Management Corporation, and with other First Nations. The Chiefs and Councillors are elected to represent and serve the Ĩyãħé Nakoda, and must also address internal social and economic concerns impacting the communities at a local level including, but not limited to: corrections and justice, economic development and land use, education, emergency and security services, employment, family services, housing, infrastructure, recreation, wellness and health care. A fundamental component of Tribal Council governance is transparency and accountability of the financial system. Fiscal responsibility is essential to prevent corruption and to ensure resources are managed for the greater good of the Mĩnĩ θnĩ Wa-pta, Kiska Wa-ptadn, and Ga-hna communities. Abiding by ancestral cultural protocols of the Ĩyãħé Nakoda, the Chiefs and Councillors provide guidance and direction to the people, and also attend various community gatherings, services, and ceremonies throughout the year.